Photalia belongs to the VERGNET group and develops practical services to meet fundamental needs of people, such as solar pumping systems and electro-chlorination (kits E’CHLO™). All Photalia’s solutions are designed to be installed and used on isolated sites with particular constraint. In this kind of context, system durability depends on both the design study accuracy and the quality based on our long feedback and quality components. Thanks to Photalia’s technical expertise, the emphasis on human interfaces allow intuitive use and easy maintenance. As an answer to principal limits or constraints of solar electro-chlorination, and to provide reliable chlorine for disinfecting applications, Photalia designed E’CHLO™ kits which include an automatic control of the production. Photalia controller box secures the production and guaranties reliability of chlorine in a wide range of conditions. E’CHLO™ kits (including panel, controller box, barrel, electrode, draining systems, etc). 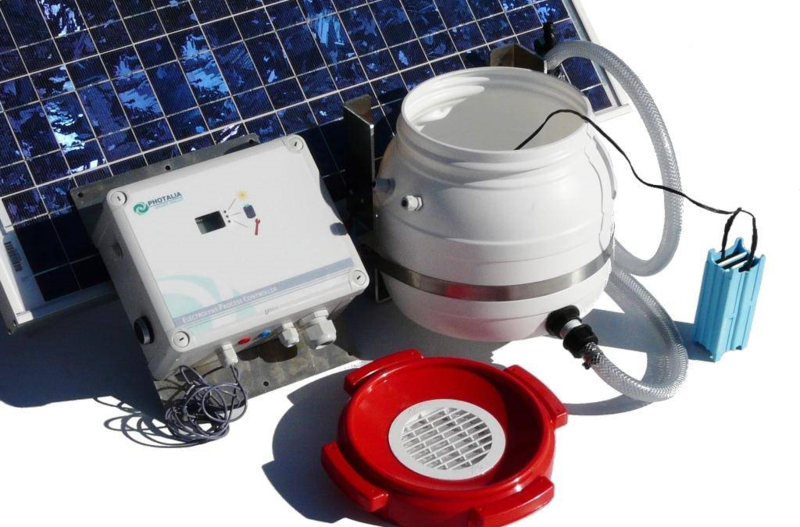 E’CHLO™ kits are solar direct drive without any battery. They are robust and easy to use. The user has only to start the production and to check the LCD display at the end, before draining the barrel. During the electrolysis, the user presence isn’t necessary. Every parameter is controlled automatically and the electrolysis is regulated to assure reliability of chlorine. PHOTALIA won “Innovation § International Trophies” 2012 – Région Centre in France for its general approach in developing specific solutions adapted to developing countries’ constraints. – Stopping automatically the production when the minimum concentration required is achieved. The E’CHLO™ are complete kits, ready to use, supplied with all equipment required to produce chlorine in good conditions (as shown on scheme). A user manual is supplied too. The wall fixation guaranty the durability of the system, the quality of chlorine produced and the protection of the user. Function such as automatic descaling for the electrode is also included. Concentration of the chlorine produced optimized for water treatment. To treat water, a concentration of 2 g/l is recommended (exact concentration depends on the quality of raw water to treat). To produce more than 5 g/l of reliable chlorine, it takes much more time: the electrolysis will have a strong impact on temperature so the process will be slow down to limit apparition of toxic component. That’s why we programmed our system on optimized concentrations, which allows producing bigger volumes of reliable chlorine at an adapted concentration. With Photalia’s controller box, the user has only to check the concentration on the LCD display of the controller box and stop the production at the concentration he wants (from 0 to 2 g/l). E’CHLO™ kits are sized and programmed to offer the best performances in a wide range of conditions. For each insolation, we are able to precise the exact quantity of chlorine that can be produced per day.